Join us every First Saturday for our free Open Studio event! A stop on the Wedgewood-Houston Art Crawl, Platetone's Open Studio includes an art exhibition in our Patricia Jordan Memorial Gallery and a hand's on activity or demo hosted by one of our members! Please join us in our new location as we celebrate our new location at 1919 Nolensville Pike! 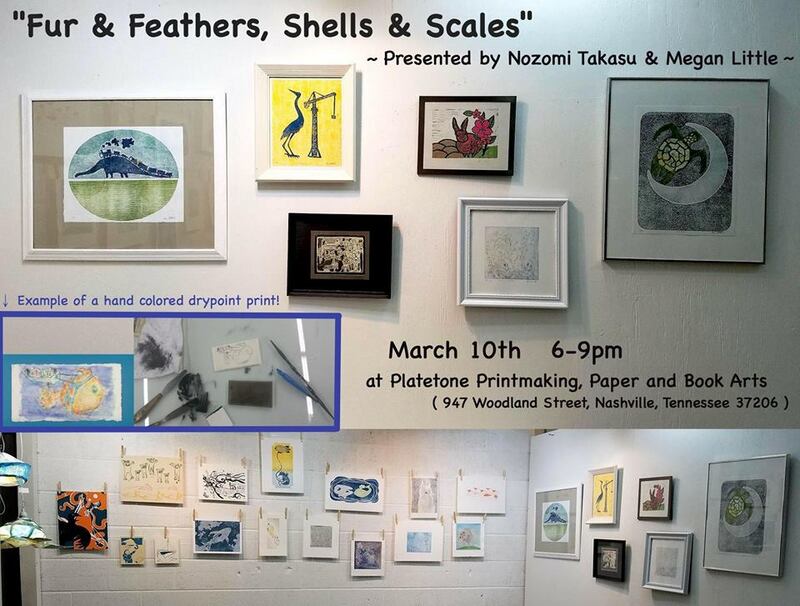 Fur and Feathers, Shells and Scales: the Art of Nozomi Takasu and Megan Little! Join Platetone for our March Open Studio! Platetone members Nozomi Takasu and Megan Little exhibit their cheerful art in our Patricia J Jordan Memorial gallery. Their work showcases their combined talent and features all sorts of creatures - from sea turtles to bunnies. Learn how to create a hand colored drypoint print in this free introduction to basic printmaking! Come celebrate green growing things in the cold of this winter month! We'll be making paper plants and flowers and enjoying a special exhibit of garden themed artwork created by Platetone members and community. Platetone is hosting a holiday silent auction! Beautiful pieces created by our members and friends are up for grabs at competitive prices, and this is the perfect opportunity to snag works from your favorite area artists. ALL proceeds go to support Platetone and it's mission to empower creatives through studio access, workshops and exhibitions! Bidding will start at 7 and end at 9:15. There are over 65 works to bid on and some marketplace pieces to buy as well. Check out some of the items on our Facebook photo album. Also, join Platetone member Megan Kelley for the gift that keeps on giving: Print Yer Own Wrapping Paper! You'll learn basic stamping and printing techniques with a hands-on introduction, and leave with a sheet of handprinted paper for display, for gifts, or even just for yourself. AND if that wasn't enough, we'll be giving away some door prizes just for coming to our event. Count on some one of a kind prints and other goodies. Our Open Studios are free and open to the public, though we always welcome donations to help us continue sharing our programming! Park in front of the Woodland Creative building, or across the street. Platetone has invited Belmont University art students to exhibit recent creative projects on paper. Gracie Knestrick, Sallie Kidman, and Zamora Vacek will show prints created from a variety of processes. Additionally, they will lead a community-engaging activity where visitors can create patterned paper di-cuts on multi-colored papers and organic monoprints! Refreshments will be provided and the Platetone marketplace will be open and art from the benefit show will still be available for purchase. "Family and Friends" Benefit Exhibit - and Reflective Screenprinting! This October, from 7-10 we will be celebrating our community and supporting Platetone with a Family and Friends Benefit Exhibit! We will also be silkscreening reflective ink onto fabric. Learn how silkscreen works or if you know, you can walk away with some cool swag you got to make yourself. Bring an item to print on or donate $10 and get a bag to print on. Reflective ink will be great for keeping people visible in the halloween time trick or treating. Put it on bags or apparel for a great reusable item. Travel the world through Megan Little's colorful watercolors! On exhibit is her collection of over 70 watercolor paintings and sketches spanning 15 years, and the globe from Canada to Italy to Morocco. Also, create your own mini whimsical watercolor-like mono-print! Park accross the street and walk to the back of the building! Can't wait to see you! Friends! 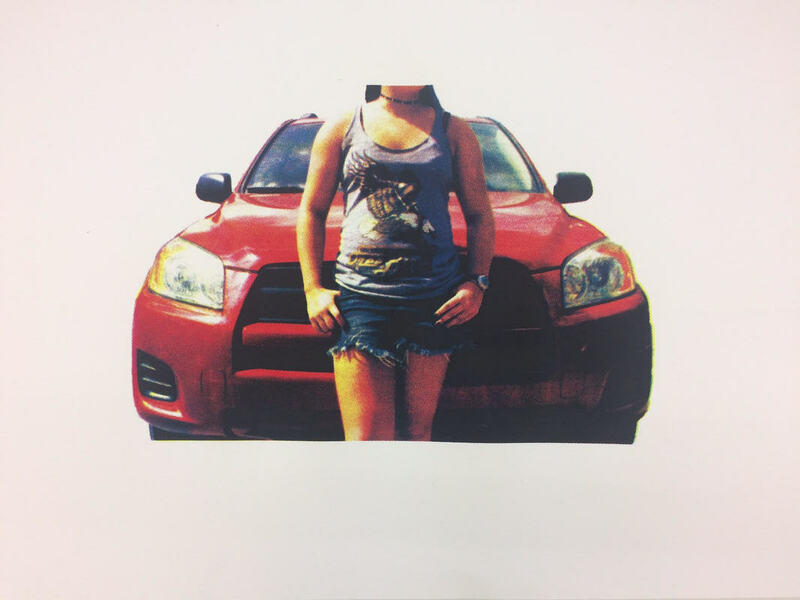 Come to Platetone this Saturday's Art Stumble (July 8) from 7-10 pm for Nozomi Takasu's exhibit and open studio. Join Nozomi in making Tanabata ornaments—strips of colored paper, where guests can write their wishes. Attach the paper/wishes to bamboo, take it home and put in your yard, make your wish come true! Bring your friends for Nozomi's art and Tanabata ornaments! We'll see you there. ​Design and print a mini-Zine with Erin Alise Borzak! 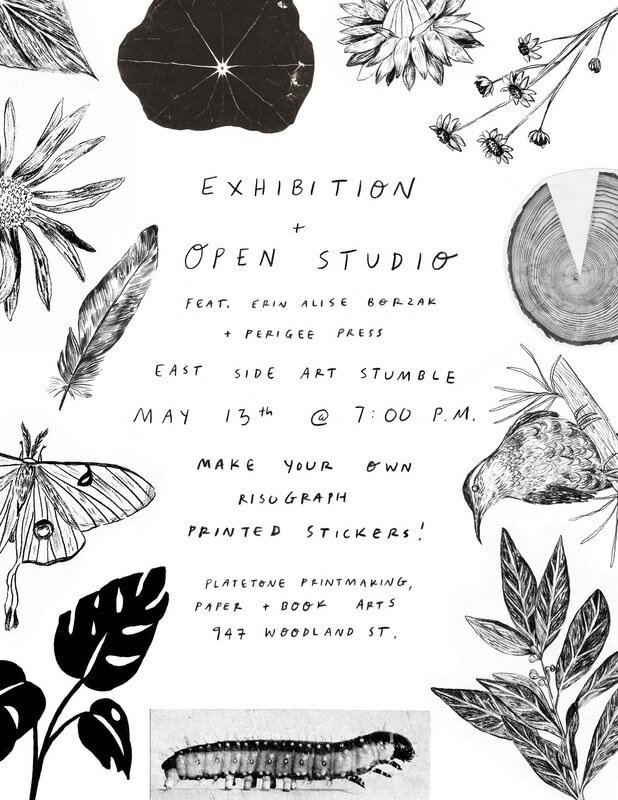 Platetone's Open Studio nights are a unique hands-on stop in the East Nashville Art Stumble! This month, Erin Alise Borak will wall you through creating a risograph printed mini zine! You don't want to miss this! Exhibition and Open studio with Erin Alise Borzak and Perigee Press. Come enjoy excellent art and make your own Risograph Printed Stickers! 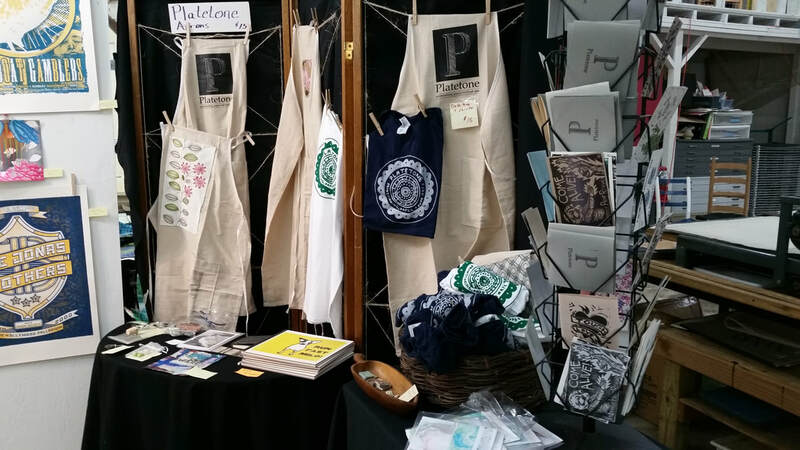 Special Invitation: Platetone is welcoming new members to our artist co-op community! Membership includes access to a full range of printmaking book and paper art equipment and facilities, plus regular opportunities for group exhibitions and a place to teach workshops. Come out on the 13th to get a tour and find out more! Join us during the East side art stumble while Lindsy Davis demos printing with plants! Bring a clipping of your favorite plant friend to immortalize on paper. Lindsy will also be showing for the first time the woodblock prints done while she was the artist-in-residence in October of 2016 at the National Homesteading Monument of America in Beatrice, Nebraska, through the National Parks Service. While there she made woodblock prints of the pioneers that tamed the landscape while also making paper from the prarie grass that makes up the landscape, printing the landscape on the landscape. Prints will be available for purchase. Open Studio: Postcard Party and Print Show! Platetone Postcard Party and Print Show! Join us for the East Side Art Stumble on Second Saturday at Platetone Printmaking & Book Arts for an evening of hands on postcard printing using a Risograph and letterpress. Make a postcard, write to your representatives, and make your voices heard! Open Studios are always free and open to the public. Donations are accepted to help us do the cool stuff we do! Email is convenient, texting is faster but snail mail can be very powerful. When was the last time you received a handmade card in the mail? Join Platetone for an exhibition of over 75 unique cards made by Kaaren Engel. 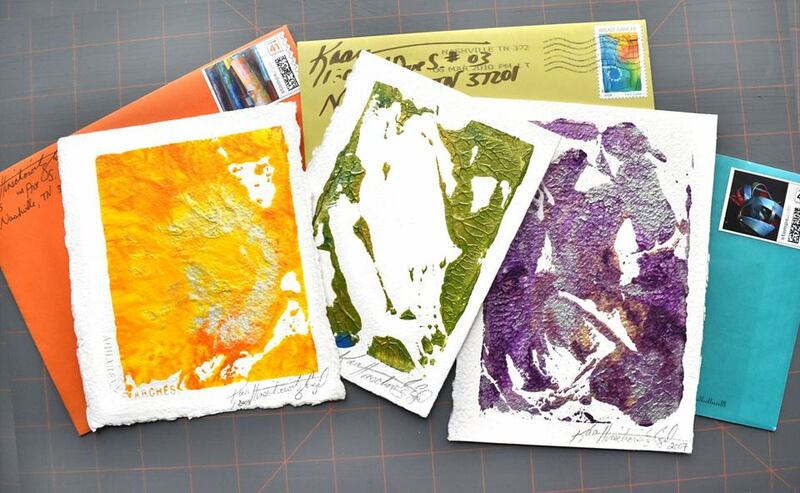 These small artworks, received and treasured by her friends will be displayed together as a symbol of Kaaren’s ability to strengthen friendships and create community the slow and caring way. So come get inspired and Platetone will provide materials and instructions to make your own cards that will cause your friends to do a happy dance out by their mailbox. Open Studios are always free and open to the public. Donations are accepted to help us do the cool stuff we do. There is no, there is no modern romance, but at least there is "It's Complicated," Megan Kelley's long, silent side-eye at the nature of relationships, contemporary emotion, and idealized notions of love. "It's Complicated" features jaded linotypes handprinted on squished dreams and cynical perspectives, and during the opening reception on Saturday, January 14 as part of the East Side Stumble, will be awkwardly paired with a Valentines Day cardmaking session, where you can handprint your own paper valentine celebrating your cat, grandma, or heaven forbid, a loved one. Our Open Studios are free and open to the public, though we always welcome donations! Park in front of the Woodland Creative building, or across the street.